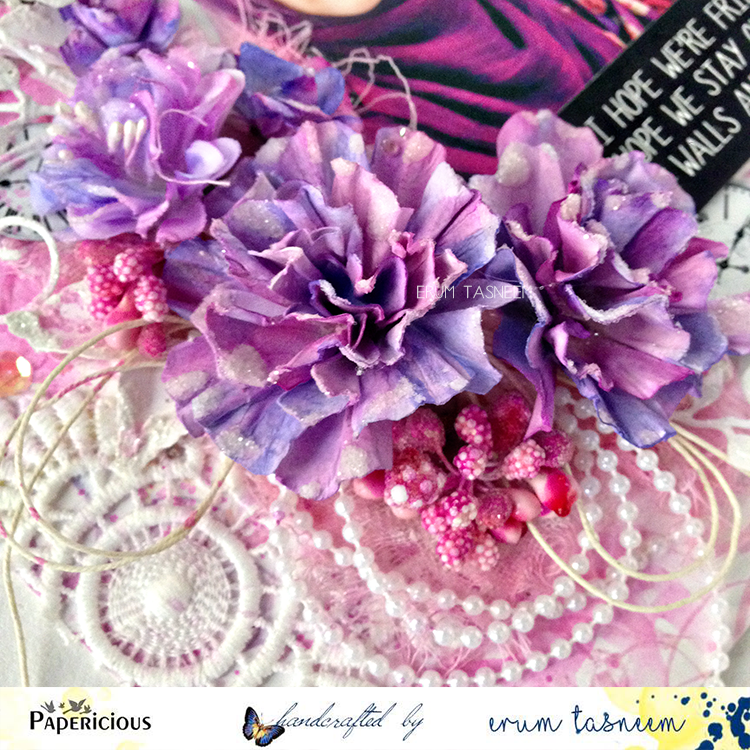 I have a post over at the Papericious blog using papers from the Fairy Land pack. 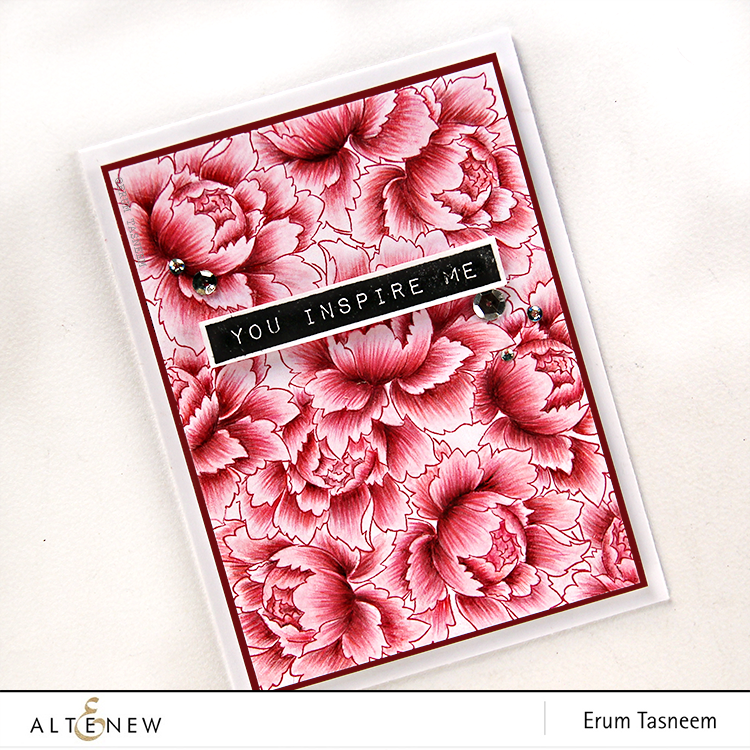 I have a post over at the Altenew blog featuring the Amazing You stamp set. Would love it if you'd check it out HERE! 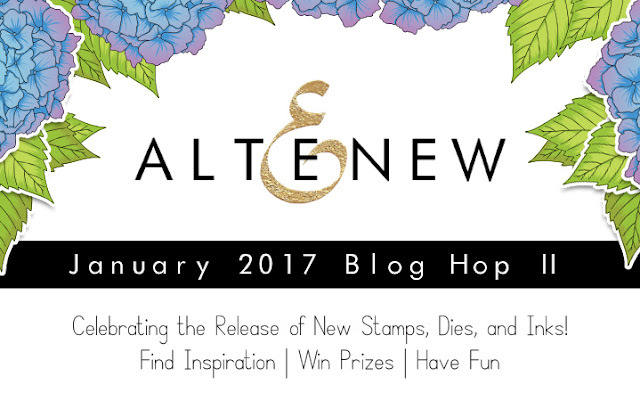 Welcome to Altenew January Release Blog Hop II! 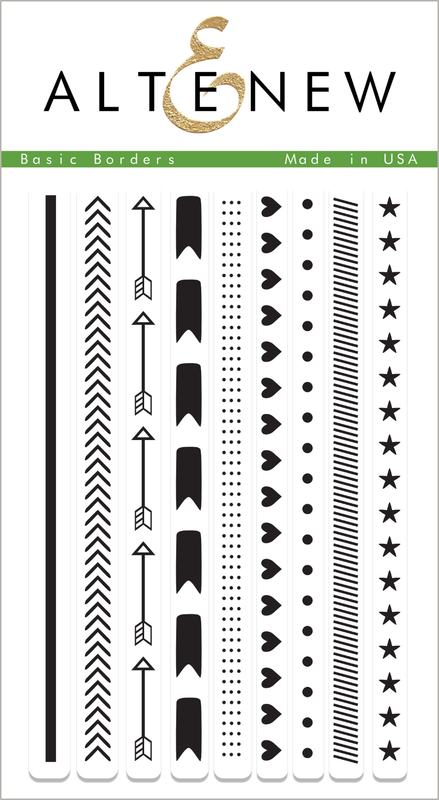 We are releasing 18 stamp sets, 18 die sets, and 12 inks! You are here from the talented Eunyoung Lee's place. If you just happen to stop by please start at the beginning from the Altenew blog. You can also find the complete hop list at the end of this post. I made four cards to share with you! 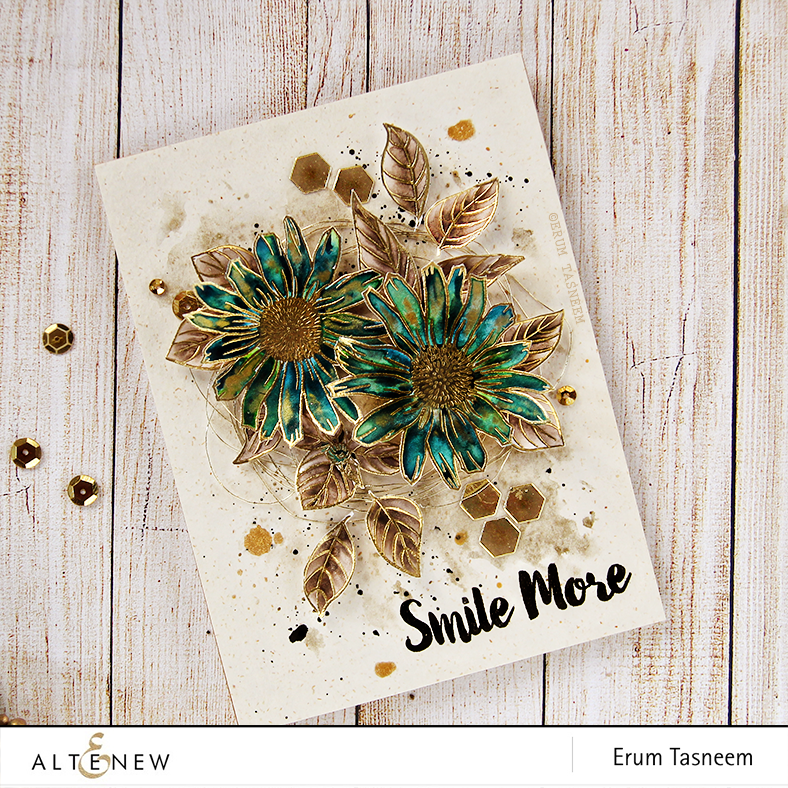 The first two cards feature the Smile More stamp set. I watercoloured the background using distress stains and pencil coloured the flowers using Faber Castell classic pencils. 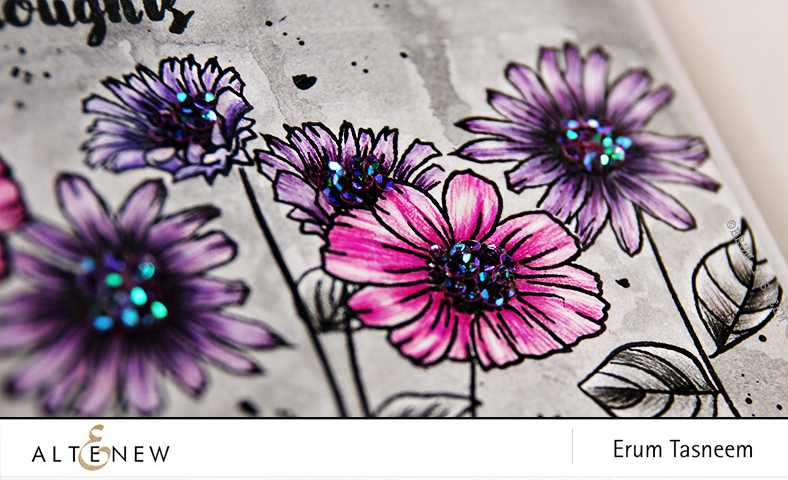 My card was severely lacking some bling so I added the smallest size sequins I could find as flower centers. Closeup photo below where you can see the colouring detail, a bit of masking I did and the sparkly sequins. For my second card I went with a more messy, grungy watercolour style. I am a little bummed that the photo didn't come out right. 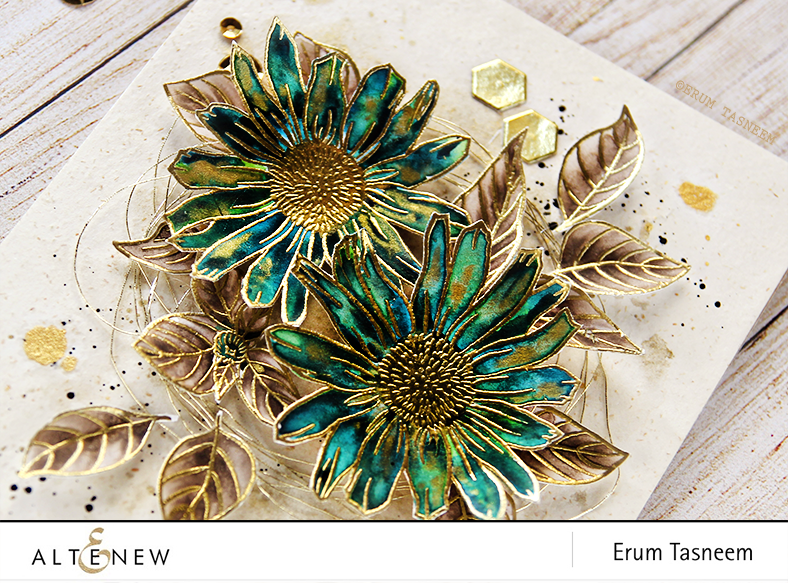 I heat embossed my flowers in gold using Ranger Superfine Embossing Powder. I watercoloured the flowers and leaves using Gansai Tambi watercolours and then fussy cut them. 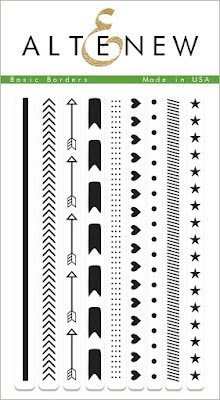 There is a coordinating die for this stamp set too, I didn't have one but you can get from the store here. I added a bit of gold watercolour to this blue green combination. I love the two tone watercolouring, you will be seeing more of that in my next post. It looks super messy but oh-so-gorgeous in person! Even the background (that looks brown in photo) is gold! 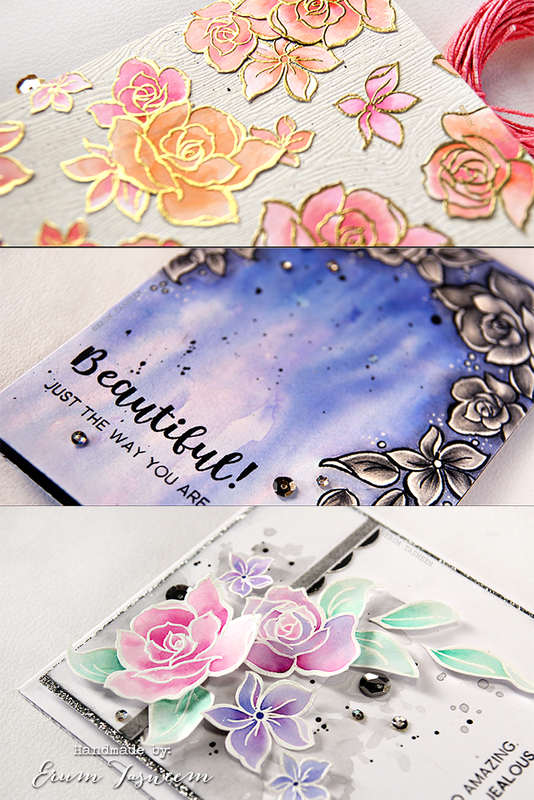 And my final set of cards using the Basic Borders stamp set and the gorgeous silver glitter tape. Instead of pulling out a single stamp to make my border, I chose to use the whole stamp set as a background stamp! I couldn't decide if I wanted to keep the one with white heat embossing or one with black ink so here I am sharing both versions. I used the silver glitter tape to make my mat for the watercoloured panels. These tapes are beautiful and the glitter doesn't come off (there is one in gold too!). You should definitely get your hands on them. 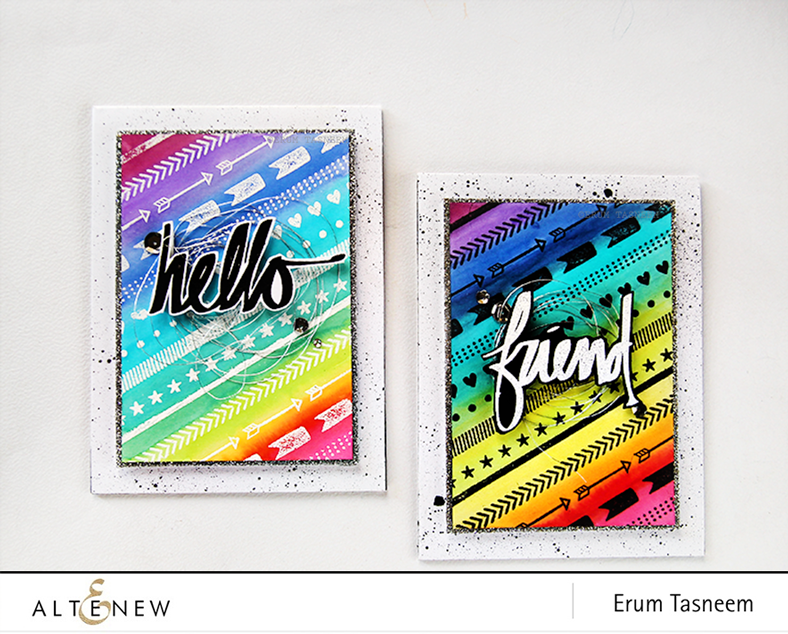 For the above card I used "hello" from the Super Script Stamp set and white heat embossed the Basic Borders stamp on watercolour paper. I watercoloured the background using distress stains. For my card above I used Archival ink in Jet Black to stamp my "background" and watercoloured the piece with distress stains. 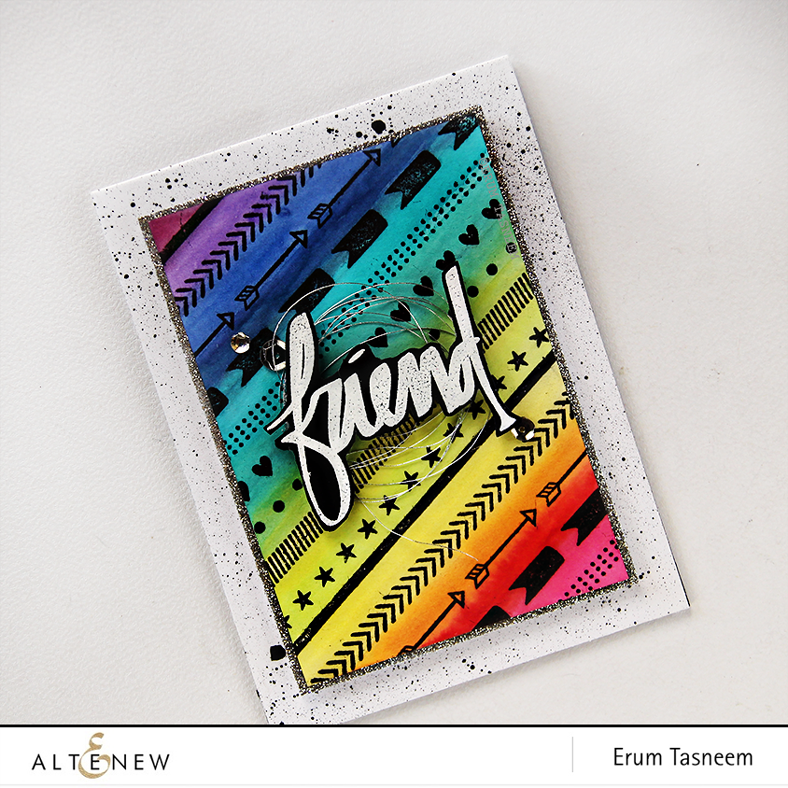 The word "Friend" is from the Super Script Stamp set, which I heat embossed on black cardstock. 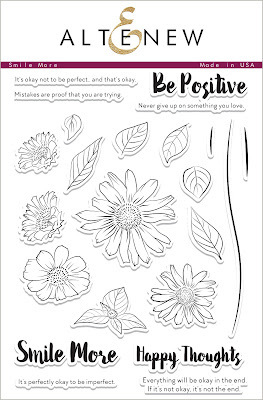 I will also be picking out a winner from the comments left on my blog. The winner will be winning a $30 gift certificate to the Altenew store. You have until February 2nd to leave comments. The winner will be announced here on my blog on Saturday, February 4th. Now please head on over to the amazing Lilith Eeckles's blog. Here is the complete hop list. Today I have an AWESOME news to share with you all! After keeping it a secret for so long I can share with you guys. The most amazing thing to have happen in 2016, that one E-mail. A very important one! I was invited to join the Altenew Card Design Team!! Let's break into a dance, shall we?! 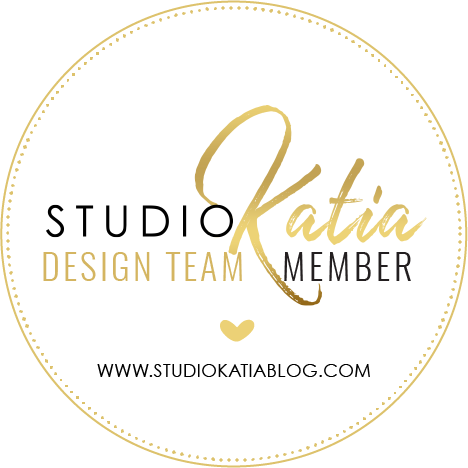 I am SO honoured and absolutely thrilled (read- going crazy doing the happy dance) to be part of this amazing design team! I have shared my love for this company way too many times in the past so you all know how excited I must be right now! I wanted to shout it out from the rooftop! For real. To celebrate I have a card to share with you today. I will be giving away this card to one of you! I used the Peony Bouquet and Label Love stamp sets. 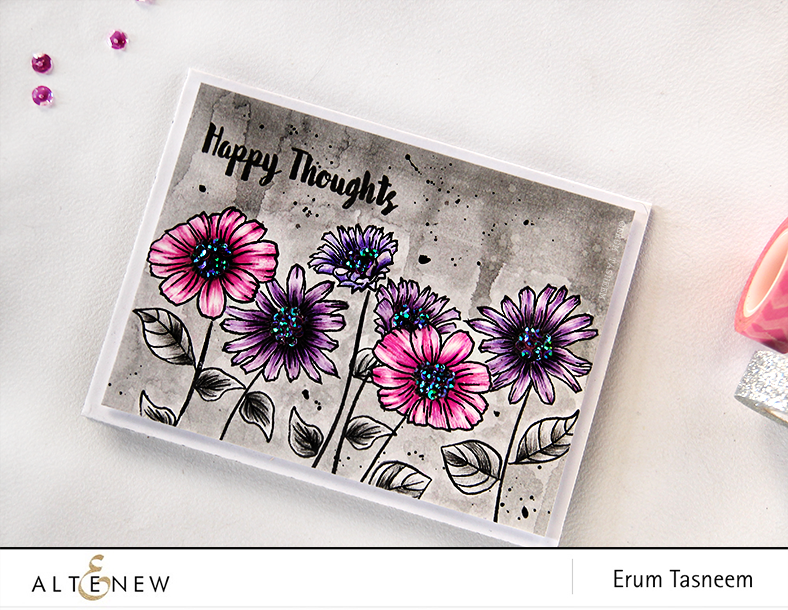 I stamped the flowers using Ruby Red Crisp Dye Ink. 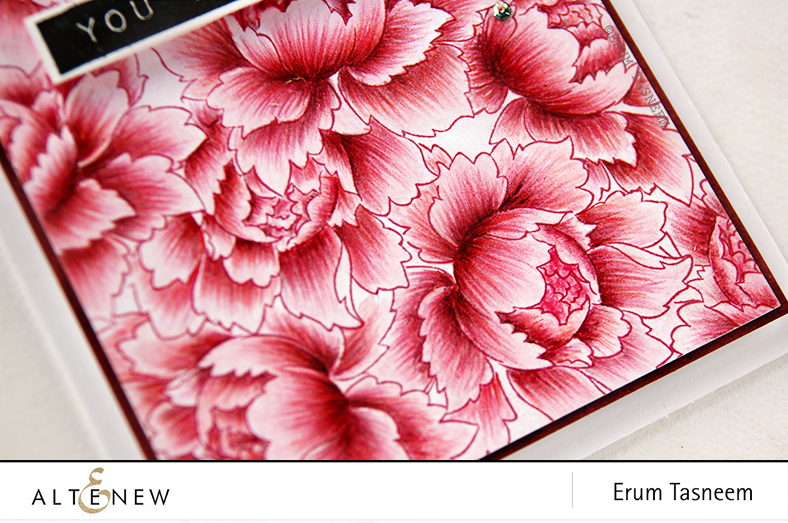 The flowers are coloured using Faber Castell classic pencils. My Prismacolor arrives next week, I will try this background again! I am over the moon excited to start this journey, it is a dream come true! I have not stopped pinching myself! Every few days it hits me and I am like "I can't believe I am part of Altenew. Crazy." Thank you very much for stopping by! Wish me luck! You have till 28th January to leave a comment. I will contact the winner via email. I have a new project over at the Papericious blog! Please do stop by to check it out. 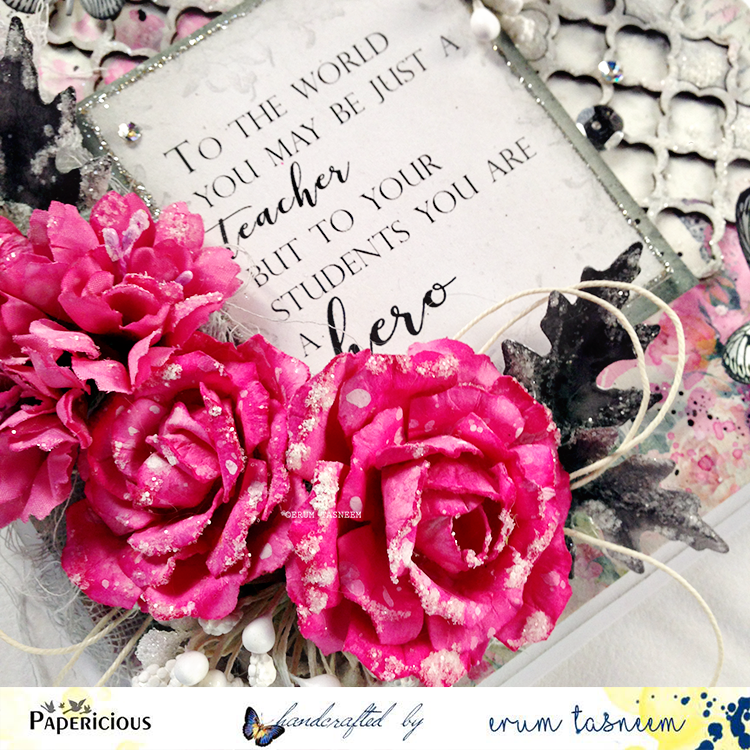 I have a LO to share with you over at the Papericious blog. Make sure to stop by and say HI! I am here to announce one lucky person who will receive a card from me! But first I have to thank each and everyone of you for leaving so much love on my blog and to those who sent me private messages!! Believe me my blog HAS NOT seen this much love in a long time! HA! I am very grateful for the chance to be part of this hop and share my love for Altenew with all of you. Please send me a message using the contact form on the right hand side. Mention your email address too so I can write back to you.